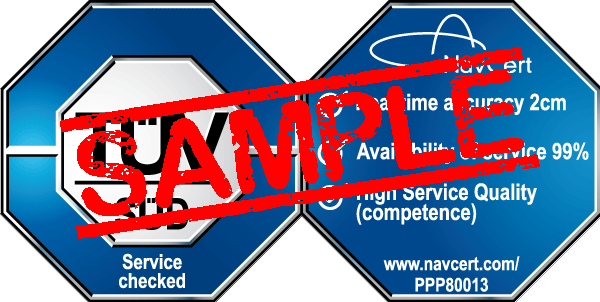 This certification mark is awarded to a ground-based Correction Data Service for satellite positioning allowing real-time positioning up to an accuracy of ±2cm in horizontal position. Verification subjects are the real-time positioning accuracy, the availability, and the quality of the service. The company’s service foreseen for certification is analysed to ensure consistency of the promised service quality offered to customers. Testing focuses on the scope of services, functionality and service quality. Measurements and subsequent statistical analysis give evidence that a positioning accuracy of up ± 2cm (at 2 sigma) for 2D position can be achieved in real-time. Service availability is verified through an audit and by review of the recent ‘Availability of Service’ statistics for a period of two years. The audit verifies the technical and organisational measures that have been taken to reach the goal of 99 % availability.